Contact with the sap of boxwood may irritate the skin in some people. Fertilize in spring with an all purpose fertilizer before new growth begins. Keep watered during dry summer days until well established. Light pruning to maintain shape. Click on the "About Us" tab to find planting instructions. 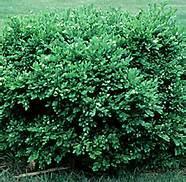 The boxwood is a very popular ornamental shrub, being particularly valued for topiary and hedges because of its tolerance of close shearing, small leaves, and scented foliage. This hardy and compact plant offers leaves of dark green above and light or yellowish green beneath and usually lustrous on both sides. It produces creamy yellow flowers, without petals, in small clusters in the spring. The boxwood is an excellent specimen good for hedges, mass planting and formal gardens and is often called the aristocrat of the hedging plants.